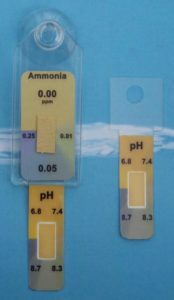 In water, ammonia is a colorless, odorless substance that can only be detected by testing specifically for it. Unlike gaseous applications where high ammonia levels can sometimes be detected by its odor, aquatic applications require a test kit or sensor. Ammonia can and does accumulate in aquaculture systems causing mortalities, a decrease in fish production, and increased incidence of many diseases. In nature, ammonia is formed by the action of bacteria on proteins and urea. It is toxic to fish and aquatic organisms, even in very low concentrations. When levels reach 0.06 mg/L, fish can suffer gill damage. When levels reach 0.2 mg/L, sensitive fish like trout and salmon begin to die. As levels near 2.0 mg/L, even ammonia-tolerant fish like carp begin to die. Ammonia levels greater than approximately 0.1 mg/L usually indicate polluted waters. As described above, ammonia, even in low concentrations can be extremely problematic and potentially fatal to aquatic life. For fish farmers, unhealthy fish translates into lost revenue and potential damage of reputation; for water treatment facilities, a high concentration of ammonia can indicate a malfunction or defect in the treatment system. In either scenario, both are preventable by constantly monitoring the ammonia and taking corrective action when levels become too high. While not immediately preventable, environmental monitoring of lakes, rivers, and streams for high ammonia concentrations can raise a flag that pollution is affecting the area and long-term plans for remediation need to be pursued. 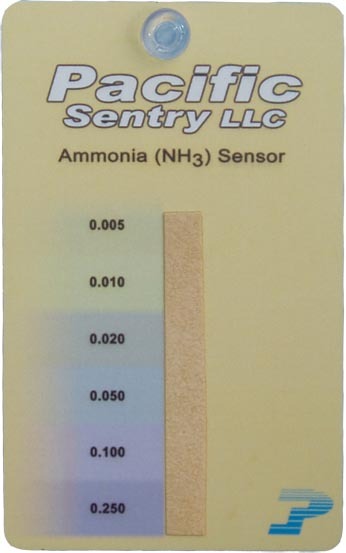 With the ability to detect down in the 0.005 ppm’s range, we are confident our aquatic ammonia sensing technology will provide you the ammonia detection and monitoring solutions you require for your aquatic environment. Current off-the-shelf products include the Ammonia Aqua Sensor and the Ammonia/pH Aqua Sensor, however, Pacific Sentry is dedicated to providing you the right solution for your specific application so if you require a different configuration, just contact us and describe your situation/need. We don’t just offer products, we offer solutions. Ultra-sensitive, reversible, and long-lasting ammonia detection for any aquatic environment. For more sophisticated ammonia detection and monitoring of your aquatic environment, Pacific Sentry can develop turnkey sensing solutions that minimize the involvement of the operator. Imagine being able to constantly monitor your fish tank or water treatment facility from any remote location; if the ammonia rises above a pre-defined level, an alert notice is automatically sent directly to your mobile phone or email so that corrective action can immediately be taken. The quicker a rising ammonia level or spike is identified, the greater chance you have to save your aquatic life or address a problem at your treatment facility. Please enquire about this service as it is still in development.